I don’t mess much with Thanksgiving dinner. A couple of times I have put nuts and apples in the dressing and I have tried Martha Stewart’s wine and butter soaked cheesecloth to cover the turkey. They were great, but no more fancy schmancy ideas for me, thank you very much. Turkey, stuffing, mashed potatoes with turkey gravy, pumpkin pie, custard pie, a layered pumpkin pie for Hubby who doesn’t like traditional, cranberry sauce from scratch, plus a can of the jellied stuff for Hubby, corn, Grandma’s summer squash, sometimes green beans, relish tray, rolls with butter, mulled cider, and the newest addition (10 yrs. in a row now) my step mother’s sweet potato casserole with crispy marshmallow topping. That is all. 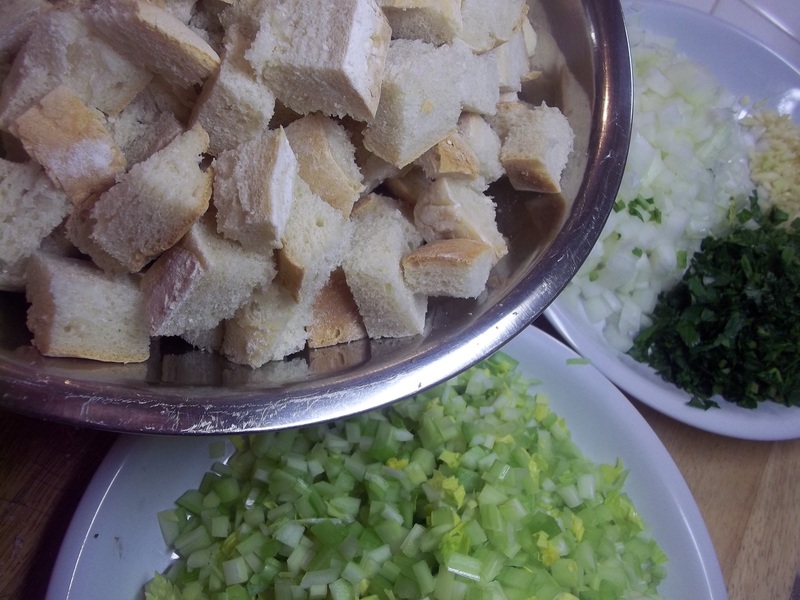 I’ve never used a recipe for my stuffing so had to work hard to pay attention to what I put into it, making precise measurements so it could be blogged. I make it a day ahead of time and, though I know they say not to do it, I stuff the bird and neck cavity with a good bit of it and bake the rest in a casserole dish, adding stock as it cooks. I not only test the temperature of the bird to see when it’s reached the proper internal temperature, but I always check the temperature of the stuffing inside the bird too. It is always to the proper temperature and no one has ever gotten sick, so I’m sticking with tradition on that one. 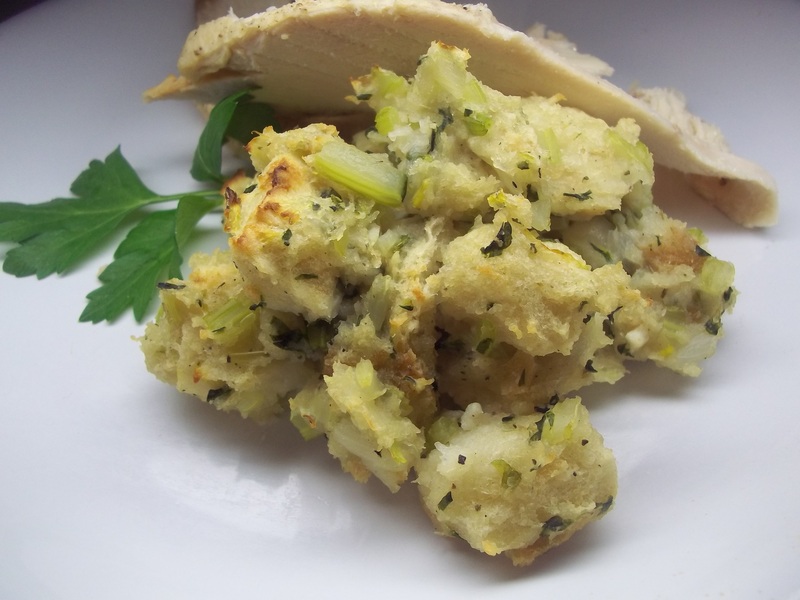 It is the best, the stuffing with the turkey juices baked all through it. The casserole full never tastes as good and the texture is all wrong. I ran into that problem today trying to take a picture of the finished dressing. It tasted great, looked fine on the plate after I broiled it to give it some color, but it is so different from what tomorrow’s finished result will be when it is scooped out of the bird, that I think I will add an additional picture to this blog post after Thanksgiving. I get up very early on Thanksgiving mornings, one of my favorite traditions, and while everyone is sleeping I stuff the bird. Then I rub him down real good with butter and salt and pepper him. He gets a nice puffy tent of foil before going in a 350 degree oven. After an hour or so I turn it down to 250 and have my coffee or slip back under the warm covers with my husband. Depending on the size of the bird, he roasts for 6 to 8 hours. The last hour or so, I turn the temperature back up to 350 and let him brown while basting every few minutes. We watch the Macy’s Day Thanksgiving Day Parade, the annual dog show, and Miracle on 34th Street while I make mashed potatoes, gravy and throw the quick and easy dishes in the oven to finish. Pies are done the day before, as well as the sweet potato casserole prepared, cranberry sauce made and chilled. I love every bit of it. I just can never get over the fact that I cook, literally for days in advance, getting this one meal ready and it’s all over in ten or fifteen minutes. I suppose I’m not the only one that feels that way, but still, I wait all year for my favorite week of cooking. It is the day before Thanksgiving around 4 p.m. The stuffing is made. I still have pies, sweet potato casserole, and cranberry sauce to make and I haven’t even thought about what to make for dinner. Chaos. I love it!! My garden has been wilted by repeated frosts. 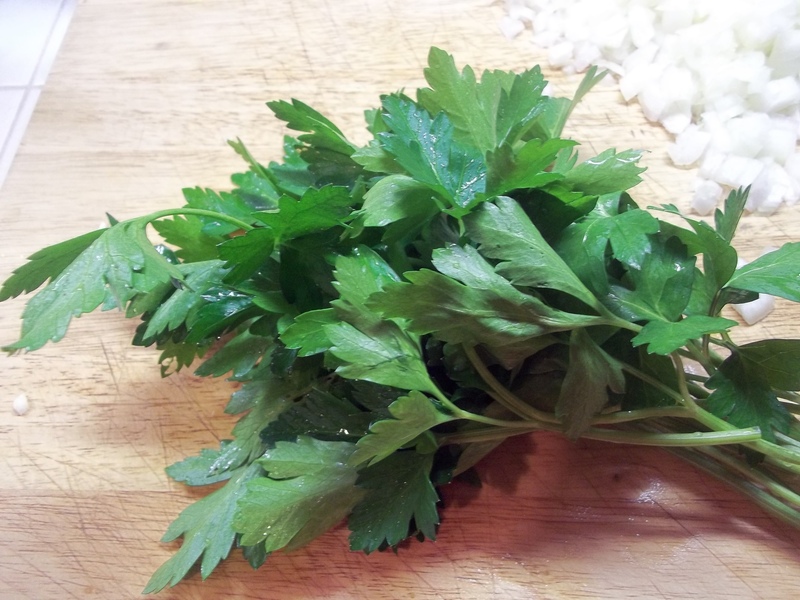 I love it that only heavy snows hurt my parsley and I will have it for most of the winter. Isn’t that purty? 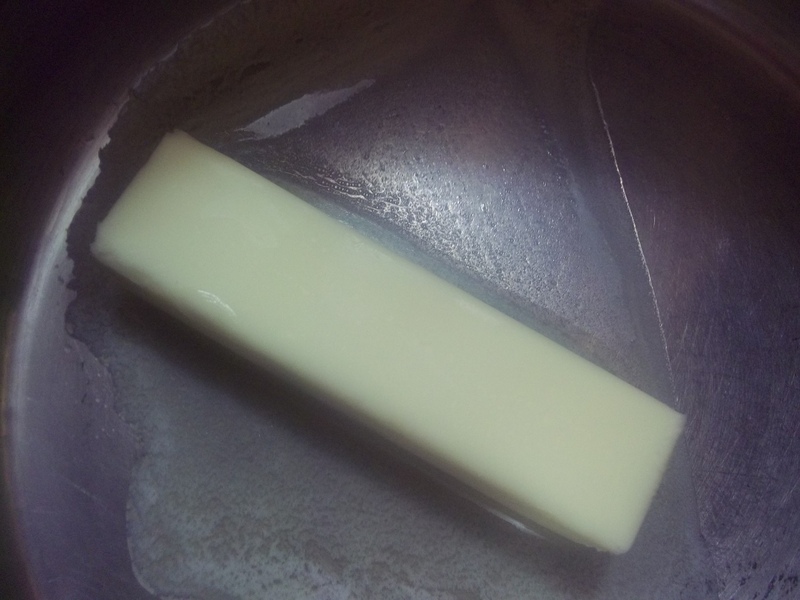 Melt the butter in the bottom of a large stock pot over medium heat. 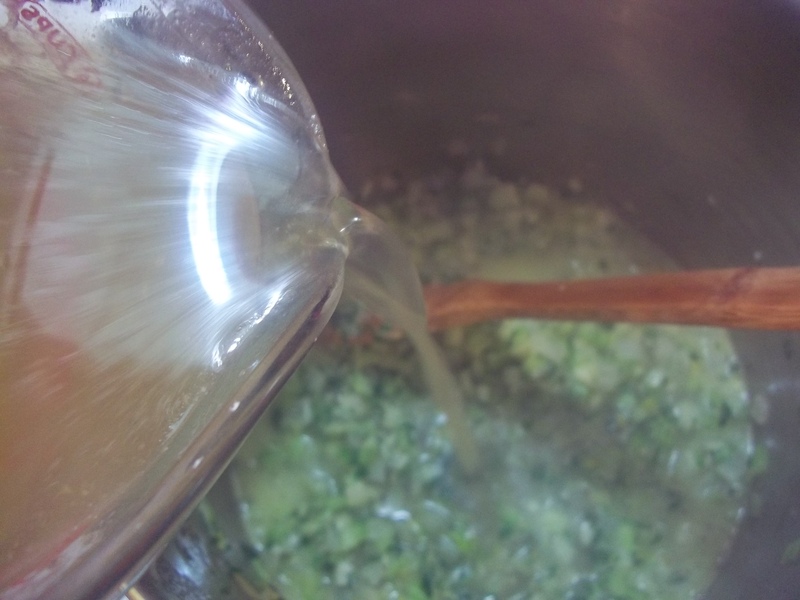 Saute the garlic till translucent. Add the onions and cook them until translucent as well. 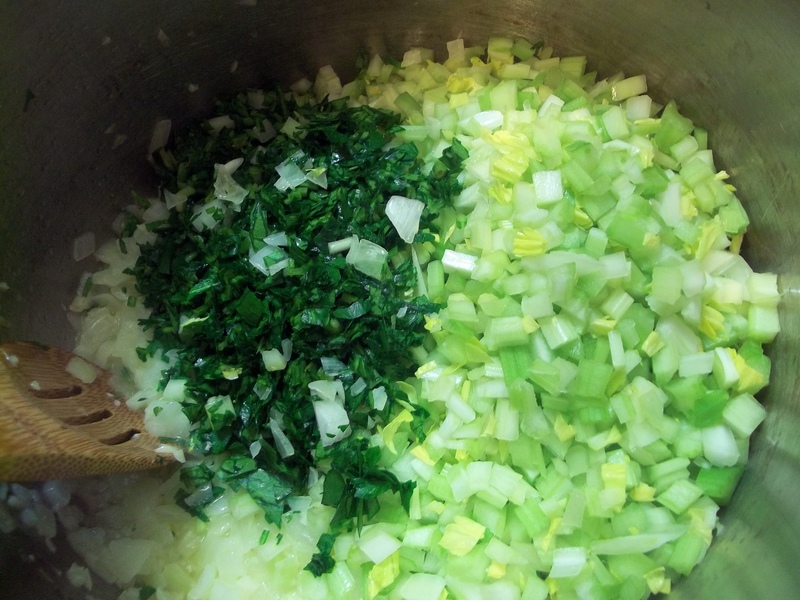 Stir in the celery and parsley, sage, salt, and pepper. Cook, stirring frequently, until all the vegetables are translucent. 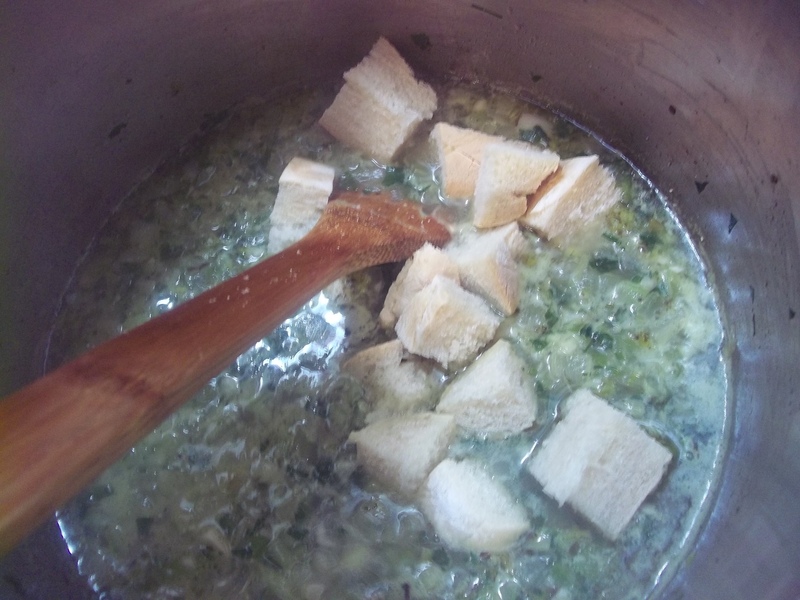 Add the stock and simmer for 10 minutes or so. 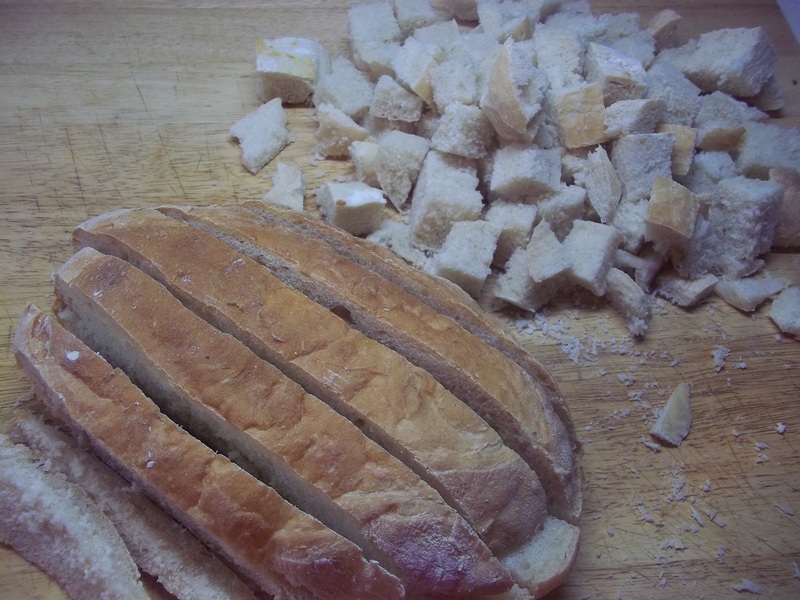 Variations: You can add more bread if you like drier dressing or more stock if you like it more moist. Some people add eggs to firm it up. I leave them out. You can also adjust the salt and pepper at the end of the process to your taste. Also, I used dried sage. Fresh sage will lend a different flavor and require different amounts as will the addition of other herbs. Sometimes I add the cooked carrots, celery, and onions from my turkey stock which makes the stuffing really moist. Cooked giblets or turkey pieces can also be added. I chose to keep this year’s plain and simple. I looked at the first photo and audibly said; “Mmm, that looks good!” I am alone. Thanks. It’s a good thing someone thinks the picture is okay. I forgot to take one of the finished stuffing at dinner. And I am only commenting to be polite. I am so full I can hardly look at this post or the site or think of anything Thanksgiving or food related. Ugh!